Crepes are a delicious French thin pancake which are very versatile. They can be filled with virtually anything from sweet to savory. It is a super easy pancake to make, which will impress your guests. I love to fill them with fresh fruit and ice cream, but go ahead and get wild with ideas for fillings. This is of course anther favorite for my kids too. If you are having a party and want to have a dessert bar I would recommend having crepes. I hope you enjoy. In a stand up mixer or blender add eggs, flour, vanilla, milk and salt. Blend until smooth and well incorporated. Tip: You don’t need to brush on extra oil unless the pan begins to stick. In a blender add 6 strawberries, zest, powdered sugar and blend for about 2 minutes until smooth. If you don’t want any of the strawberry seeds pass puree through a sieve. Take crepe, fill it with vanilla ice cream and strawberry puree, & roll it up. 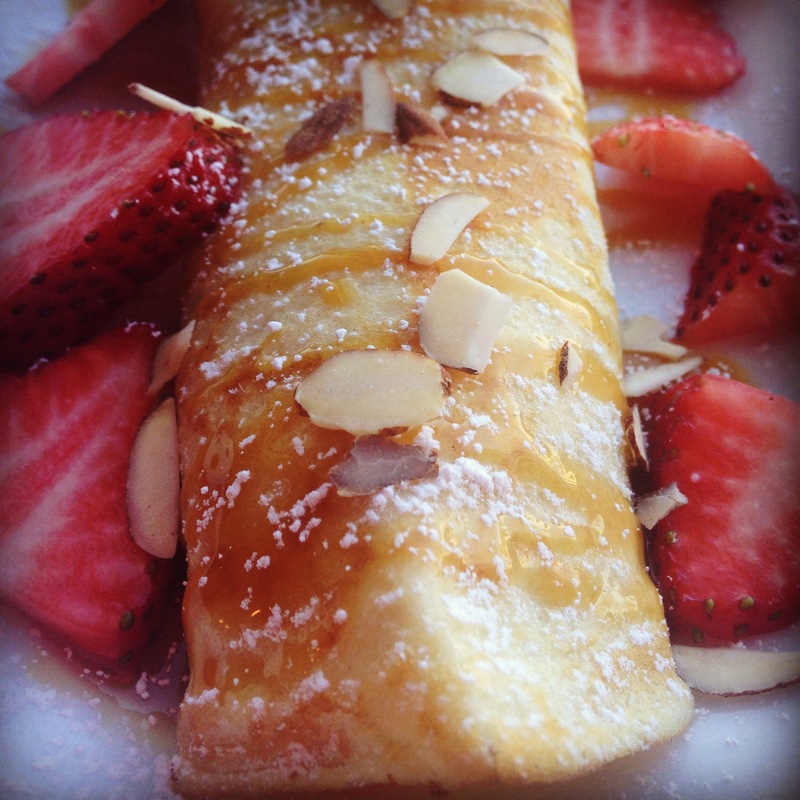 Top with extra strawberries, almonds, drizzle some warm caramel on crepe and sprinkle some powdered sugar. Next Post Homemade Delish Cookbook! I haven’t made creeps in ages. You make me think its time to dust off the pan! Crepes! One of my dearest memories is sitting in a small creperie along the Seine, the wind and sleet blowing outside, eating a savory crepe with a cup of hard apple cider with my darling wife. Thank you for the recipe! Ok so I tried making crepes a few years back and tore most of them. Not sure if that was me not pouring enough or the pan not being greased well. Thoughts? I always press my pan with oil and sometimes even more then once before making another. DO you use a smaller pan?? Yum! I love crepes! Surprisingly, I enjoy cooking yet, have never made them. I shall very soon. Already added to my Sunday breakfast menu! Strawberry and vanilla ice cream. Nice combo. Must try out….